US President Donald Trump would gladly face Oprah Winfrey as an opponent in the 2020 presidential race, a White House spokesman said on Monday after social media buzz from her speech at an awards show thrust her name into the political arena. She is actively thinking about a run, CNN reported on Monday, citing two of her close friends. CNN did not name the friends, who it said had spoken on condition of anonymity. At least one emphasised that Oprah had made no firm decision. Wearing a black gown to show support for victims, she used her platform to promote the “Time’s Up” movement against sexual harassment and assault, throwing her support behind others who have exposed sexual misconduct in Hollywood and elsewhere in politics and the media. “She had that room in her hands. It was like a campaign rally,” said Sherry Bebitch Jeffe, a senior fellow at the University of Southern California’s (USC) Price School of Public Policy. 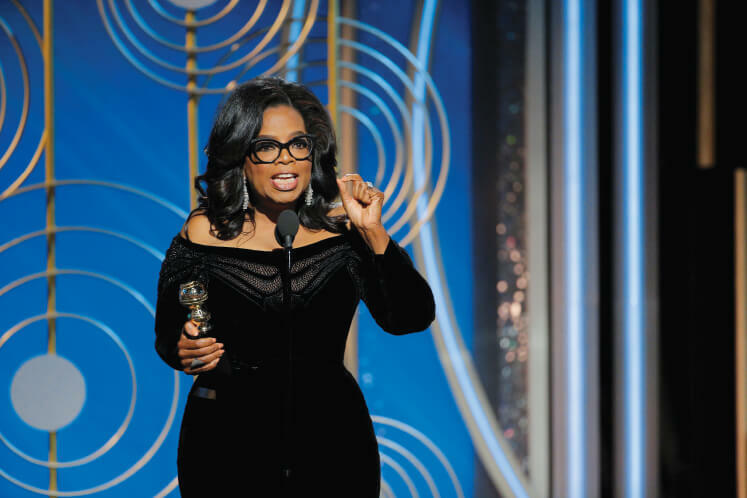 The nine-minute speech generated two standing ovations from the Hollywood glitterati and prompted 220,000 posts on social media mentioning the words “Oprah” and “president” in just 24 hours, said Todd Grossman of social media analytics company Talkwalker. After Trump won the White House in 2016 with help from his fame as a reality TV star, it no longer seems far-fetched to consider a similar campaign by Oprah, an actress, movie and television producer, and chief executive officer of her OWN cable channel, political analysts said. Oprah, long associated with Democratic politics and fundraising, would likely face a crowded field in the Democratic primaries in the 2020 race. But given her connections, Oprah might have a fundraising advantage over her rivals in liberal Hollywood, which is often called an automatic teller machine for Democratic candidates. “She’s certainly a bigger celebrity than Trump ever was, especially in terms of connecting with her audience. Obviously this has given her an opportunity. What does she do next with it?” said Alan Schroeder, a journalism professor at Northeastern University in Boston who has written on the intersection of show business and politics. His committee spent US$343 million in the primary and general election campaigns with the help of US$47.5 million of the real estate developer’s own money, which he lent to the campaign and later forgave. Hillary Clinton, his Democratic opponent, spent US$585 million including US$1.5 million of her own money. Oprah could supplement any campaign with her own wealth. Forbes estimates she is worth US$3 billion compared with US$3.5 billion for Trump. She was raised in poverty by a single mother and went on to host the top-rated talk show The Oprah Winfrey Show for 25 years before ending it in 2011. Jeffe, the USC professor, cautioned against thinking of Hollywood as a monolith of liberal Democrats. Besides the liberal creative talent, Hollywood money also comes from the more conservative, unionised trade and craft workforce as well as from the business interests.